More writing inspiration came recently on the back of a lovely weekend spent at the Abergavenny Food Festival, at which we sampled and bought all sorts of lovely edible goodies, and which followed hot on the heels of an amazing holiday that Mr W and I had in Sorrento where we indulged in some of the most delicious pasta dishes imaginable. We’d brought back a packet of Setaro linguine, Setaro being – supposedly – one of the best brands of dried pasta available in Italy, and I was waiting for the right ingredients to make a sauce that would do it justice. (Incidentally, I am still trying to find a supplier where I can buy Setara pasta in the UK, but to no avail – and an email to the company has yielded no reply!) Much as I love the idea of making my own pasta, particularly after being inspired by the Chiappa sisters’ demonstration at the Abergavenny Food Festival, I do like to keep some dried pasta in the cupboard for a quick weeknight dinner – but I’ve been spoilt by Setaro and will never buy cheap dried pasta again! 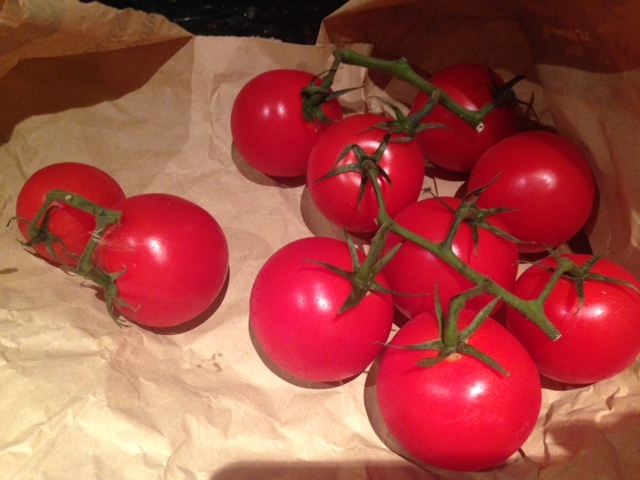 Wandering in Abergavenny’s market place, we came across The Tomato Stall, selling lovely Isle of Wight tomatoes, and I made a speedy purchase as I felt that these would be just right for a sauce with the Setaro linguine. 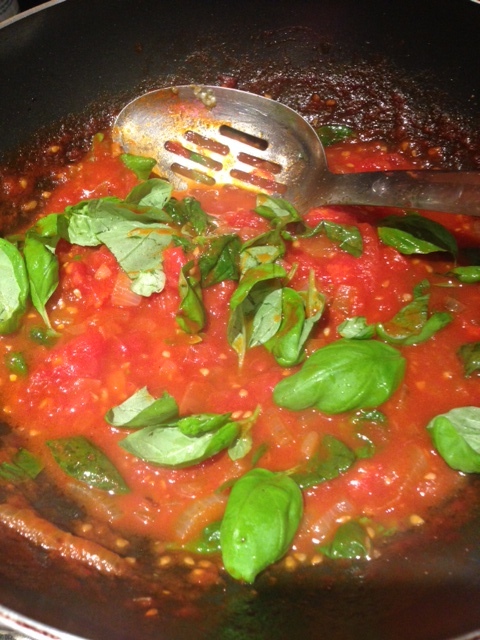 I wasn’t wrong – the resulting meal was utterly delicious, so I thought I’d share my recipe for a simple tomato and basil sauce that evokes the memory of one we ate at a vineyard on the slopes of Mount Vesuvius whilst on holiday. Apologies for the lack of specificness in quantities in this recipe; this is the way I cook, and the secret is to keep tasting as you go along and to really get a feel for your ingredients and how they influence the flavour of the food you are cooking. It seems to work for me! Boil a pan of water and plunge the tomatoes in to it for a few seconds until the skins split. Fish them out and remove the skins. 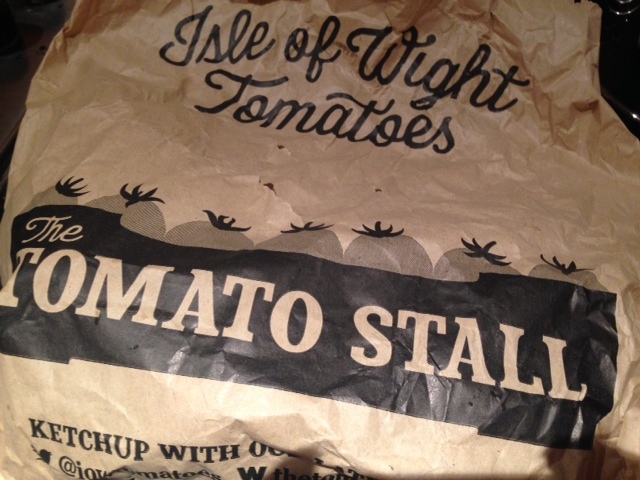 Roughly chop the tomatoes. Finely chop the onion and sautee in a large knob of butter in a deep frying pan. Crush the garlic and add to the onion. Do not allow the onion or garlic to go brown. Add the tomatoes to the onion and garlic and cook over a low heat until they start to break down. You can give them a hand with a wooden spoon. 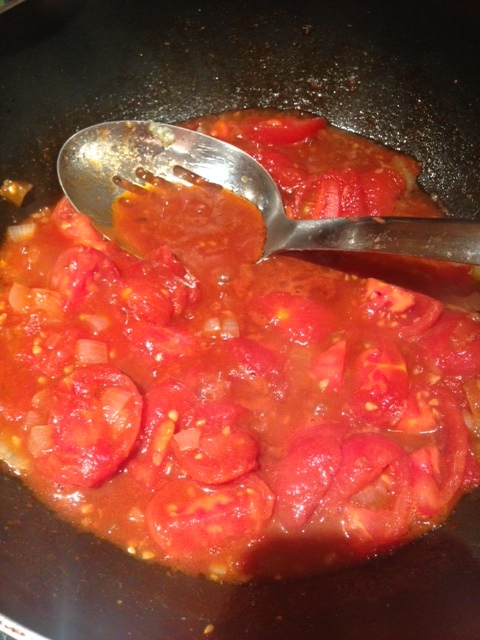 Add about a tablespoon of tomato puree, the same of balsamic vinegar and two teaspoons of sugar. Season with salt and freshly ground black pepper to taste. Continue simmering the sauce until the tomatoes have mostly broken down and the sauce has a smooth consistency. You may want to add a small amount of water to thin the sauce. I also add a glug of extra virgin olive oil at this point to make the sauce really glossy. Meanwhile, add your pasta to the pan of boiling water. I cooked mine for around 10 minutes but, again, you’ll need to taste to make sure it’s cooked to your liking. Tear the leaves off a fresh basil plant and add these to the sauce. I like to keep the leaves whole rather than tear them into smaller pieces, and I use pretty much a whole fresh basil plant as I really like fresh basil, but you may want to use less depending on your taste. Don’t add the basil too soon as you want it to infuse into the sauce, but not to cook so much that it loses its vibrant colour. Simmer the sauce for another 5 minutes by which point your pasta should be ready too. Don’t drain the pasta; use tongs or a pasta spoon to fish it out of the water and drop it into the sauce while the sauce is still over the heat. Thoroughly stir the sauce through the pasta and transfer it to plates to serve. If the sauce is too thick to mix well, add a little of the pasta water as you mix it. 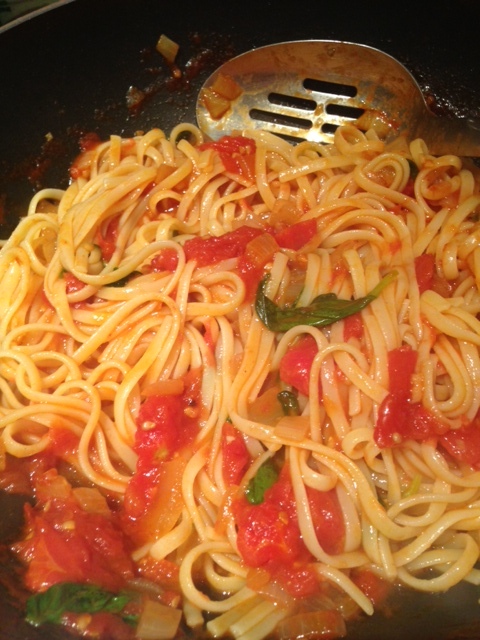 Drizzle a little olive oil over the top, add grated parmesan if you like, and top with a sprig of fresh basil. This recipe just goes to show the importance of good ingredients. If you made it with bog standard tomatoes from the supermarket, supermarket dried pasta, dried basil and ready grated parmesan in a tub, it would still be edible but would lack the delicious fresh flavours of this dish. But source some really good ingredients and it’s a delicious dish that can be made with the minimum of fuss for a simple week night supper. I could kill for some pasta right now. Oh my God that looks good.